It takes far far more than Mr. Berman’s ebullient playing, his technique and taste to draw in this audience of fans, friends, fellow composers , and the simply curious. Rather, it is Mr. Berman’s programing imagination, where 16 different works from three centuries became unified, even monumental at times. Perhaps only Donald Berman could take the seasoned somewhat old-fashioned Gabriel Fauré and the very earliest Luciano Berio, and show a kind of cohesiveness. Berio’s earliest works for piano, Wasserklavier and Luftklavier (“Water” and “Air” keyboard) in theory show little of Mr. Berio’s later work. Except this: that Luciano Berio was the most eclectic of composers, working with the most difficult Darmstadt-style compositions against the most lyrical Folk Songs, even re-creating unfinished works of Puccini and Schubert. What he always possessed was an idealism, an unfailing construction, almost an 18th Century pride of workmanship. His limpid lovely works here didn’t contrast, but were interlaced with the Barcarolles of Fauré. The First Barcarolle had the delicacy of Berio’s Wasserklavier, but the great surprise was the Fifth Barcarolle which, written in 1894, very “modern” indeed with hints at bitonality, strange dissonances. To those of us confined by the Requiem and Pelléas, these were not exactly revelations. But the connection between Fauré, and the Italian composer born the year after his death, in 1925, was an enlightening link. 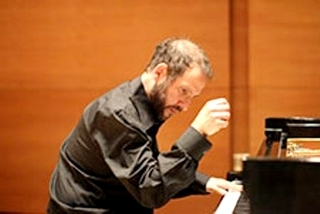 The only living composer, present at the recital, was Scott Wheeler, highly reputed by his peers but rarely played in New York. Like his teacher, Virgil Thomson, Mr. Wheeler enjoys making musical portraits of friends. And since he seems to know everybody in the music business, he has probably written hundreds. Messrs Wheeler and Berman had gone to the same conservatory, and the pianist had been honored with his own “portrait” for his wedding, one which included (as a gift) a Yiddish song as the parents guide bride and groom down the aisle. Mr. Wheeler’s seven other eclectic portraits included one for New York Times reviewer Anthony Tommasini (which seemed merrier than the usually solemn visage of Mr. Tommasini at concerts), to Gunther Schuller, with its half-play at jazz, and the most “American-sounding”, an Alphabet dance for the late Arthur Berger. Each had their kabalistic notational secrets (though this tradition goes back a thousand years), each, under Mr. Berman’s hands, had true joy. Personally, the second half was most revelatory: four different–and I stress that word–works by Charles Ives. Mr. Berman has long had musical and professional relationship with Ives (he is an executive of the Ives Society), and has uncovered many a work never before performed. What we had here was not only a masterly performance of the “Emerson” first movement of the “Concord” Sonata, but three extraordinarily dissimilar works I had never heard before. Could that Sixth Study actually have been written in 1909?? The simple melody increasingly complex, dissonant, atonal, it ran through nearly all the chromatic notes, the atonal stream-of-consciousness middle bookended with tonal, melodic other songs. Never have I heard such a short piece with such a multiplicity of styles and notes, all turning into (what might be called) an true endearment. The polyrhythmic Waltz-Rondo took Ives from an ersatz Spanish song through variations interlacing with each other, ending with a seeming quodlibet of all the music. Finally came the Fifth March, with an Irish tune in the bass which we know as the Cornell alma mater–but played with extreme variations, ending with a rah-rah march. That was written–this is unbelievable–a year after Fauré’s Fifth Barcarolle. In other words, Donald Berman, for all his technical prowess, his power, his personal charm, managed to link virtually all the music, where even Mr. Wheeler’s pieces were memories of other people, other times. It was a rare program, and Mr. Berman is a rare performer, and, on a personal note, I eschewed the subway to Manhattan strolling over the bridge, feeling an uncommon delight.